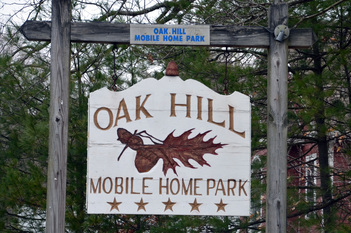 Oak Hill opened in the early 1960s and has grown over the years into a 90-site, resident-owned manufactured home community. But that transition didn't happen overnight. We began the move toward controlling our own destiny in 2015. That's when, with the help of Cooperative Development Institute and ROC USA, LLC, we formed the Oak Hill Cooperative that would, on March 31, 2016, purchase and take control of our community. Now, the ROC is not only a successful business, but also a thriving neighborhood. The process of the cooperative buying the land beneath our homes brought this community closer together. Not only do we know far more of our neighbors than ever before, but we look out for one another, too. And with no outside landlord to report to, we're the envy of other nearby manufactured home communities. Oak Hill couldn't be better situated, being close to so many important amenities. We're just down the road from great local schools and are only a 10-minute drive from Bristol Community College. We live in a very sought-after area in part because of our proximity to both 495 and Route 24, making commutes to both Boston and Providence a breeze. We're just minutes away from all kinds of shopping and outlet malls, both family-owned and chain restaurants, entertainment, churches and more. We're fortunate to have to have abundant job opportunities nearby. School buses stop right at the entrance of our community and we're just 3 miles from downtown Taunton, the Green, grocery stores, restaurants and shops. We work hard to improve our community and we celebrate with social gatherings as often as we can. Our social committee holds events throughout the year that always involve great food and entertainment. Ask anyone who lives in Oak Hill, and we're sure they'll tell you it's a little slice of heaven.